Hawaii's seasonally adjusted unemployment rate rose to 3 percent in July from 2.7 percent a year earlier, the state Department of Labor and Industrial Relations reported yesterday. At the same time, the national rate slipped to 4.8 percent from 5 percent, the department said. July marked the 52nd consecutive month that Hawaii's unemployment was at least 1.5 percentage points lower than the national rate. The islands' reported labor force totaled 651,950 in July -- 632,200 employed and 19,750 unemployed. In July of last year, 617,550 people were employed in the islands and 17,400 were unemployed. "Hawaii's economy continues to grow, with historical highs in employment and one of the lowest unemployment rates in the nation," state labor director Nelson B. Befitel said. With the exception of Molokai, all of the islands saw their employment rates rise in July from a year earlier. 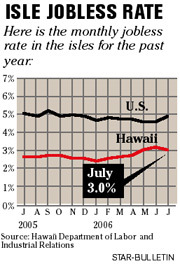 Molokai's jobless rate stood at 7 percent last month, down from 10.6 percent in July 2005. Government shed 700 jobs during the months, mainly because of the change to a unified school calendar for public schools, which led to a limited number of schools offering summer school programs, the labor department said. Leisure and hospitality also saw a decrease of 700 jobs, most likely the result of a shift from a less pronounced visitor industry seasonal trend to a more constant flow of visitor arrivals throughout the year, it said. A loss of 700 jobs was also recorded in education and health services, primarily due to a continuing strike by nurses at Wilcox Memorial Hospital on Kauai and employment decreases taking place in private schools and social health programs, the department said.